While MDOT’s metro Detroit office was trying to figure out how to remove this graffiti, the department’s central GIS team was testing ArcGIS Online and Collector for ArcGIS. Since the metro Detroit office needed to locate all the tagged signs and carefully plan cleaning operations so as not to completely disturb traffic, the central GIS team decided this would be an ideal pilot project for trying out the two ArcGIS programs. 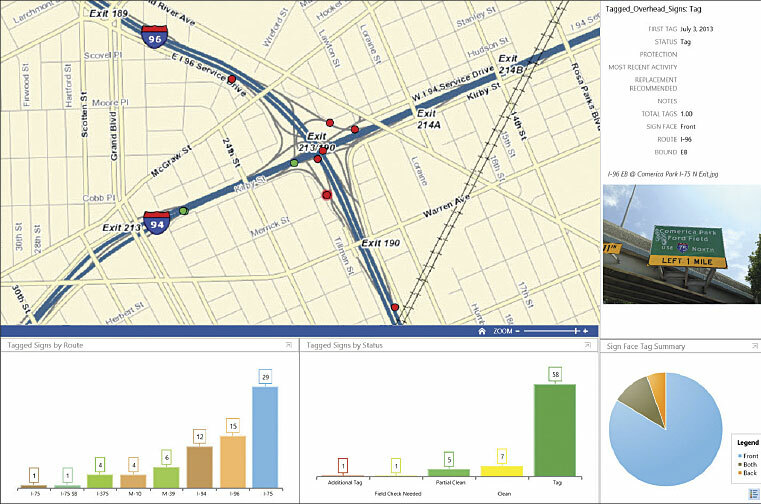 Develop a reporting tool that showed the operation’s progress to MDOT management and outside agencies, such as the City of Detroit, police departments, and the media. In the summer of 2014, MDOT maintenance staff began gathering data using Collector on their iOS phones and tablets. Every place they saw a tagged sign, they would record the location, note the sign’s basic attributes—for example, its route direction (eastbound, northbound, etc. ), which side of the sign the graffiti was on, its status in the project (tagged, clean, retagged), and the date of the most recent activity on the sign—and take a photo. This first inventory of Detroit’s freeway signs helped create the initial dataset. Following that, MDOT staff collected information about other tagged signs on a more ad hoc basis, photographing and logging new graffiti locations while they were riding in a car or updating the database when citizens called in with fresh complaints. The team also incorporated MDOT’s live lane closure service (from its 511 site) into the app. This enabled cleaning crews to track down planned lane closures so they could complete their graffiti cleaning at the same time that other roadwork was being done. Using ArcGIS Online and Collector allowed the maintenance team to be much more organized, especially since the work was being done by offices and garages that don’t normally communicate with each other. The technology helped everyone get on the same page by using common data formats and got people to speak the same language. “Having the graffiti information and photos in the online map was critical for us to be able to efficiently and accurately report [the] status of the cleaning work to our stakeholders throughout the cleaning process,” said Tony Kratofil, the metro region administrator for MDOT. This project also made the graffiti issue universal to the region rather than a problem each branch had to deal with solo. That’s in part because upper management at MDOT monitored the cleaning project through Operations Dashboard for ArcGIS. And when local and state law enforcement learned about the project, they partnered with MDOT to share data about the taggings. MDOT gave the agencies information on the locations of the tagged signs and the dates they were recorded, as well as the photos, to aid in the apprehension and prosecution of taggers. 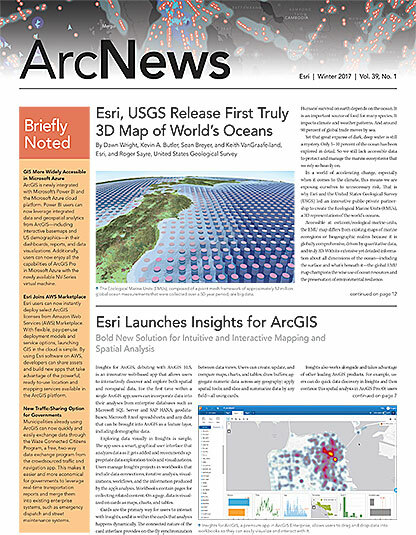 This new contract is a testament to the success of the central GIS team’s pilot project with ArcGIS Online and Collector. Using Esri technology, MDOT found an innovative solution to Detroit’s rising graffiti problem and overcame it—just like any smart community could do. Matt Robinson is a transportation planner with MDOT’s central GIS team. Joe Bartus is a senior transportation engineer with the metro Detroit division of MDOT. For more information, email Robinson or Bartus.